On Thursday, the Obama administration essentially declared that Obamacare was a “hardship” for Americans who lost their health insurance–even though President Barack Obama had promised they would be able to keep their plans–and waived the individual mandate for these Americans by enabling them to enroll in”catastrophic” plans even if they were over 30 years of age. The Obama administration estimated that there were only 500,000 Americans who received cancellation notices and have not been able to enroll in Obamacare, but those numbers have not been verified. Given that 300,000 in Floridia, 800,000 in New Jersey, and nearly 200,000 in California have received cancellation notices since October 1, the Obama administration’s estimate seems overly optimistic, to say the least. 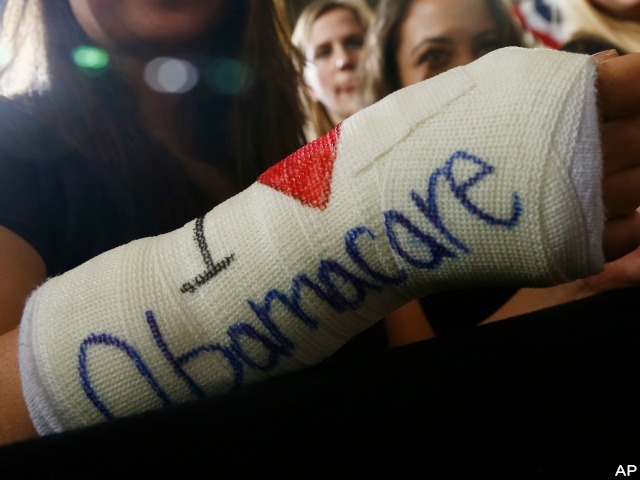 In a letter to six senators on Thursday evening, Health and Human Services Secretary Kathleen Sebelius wrote that for consumers who are “not able to renew their existing plans and are having difficulty finding an acceptable replacement in the Marketplace,” Obamacare allows for “hardship exemptions” that enable impacted Americans to purchase “catastrophic” plans, which are only available to people under 30 years of age and cost about 20% less than Obamacare plans. This means that those with “hardship” exemptions would not have to buy gold, silver, or bronze Obamacare plans and would be exempt from the individual mandate for at least a year.